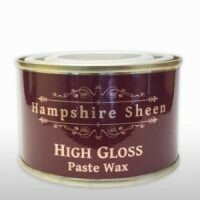 Product information "high gloss wax"
Hampshire Sheen High Gloss paste wax will produce a fantastic shine for you on your decorative turned wood pieces and is a popular finish for many turners, both in the UK and the USA. Using carnauba and microcrystalline waxes in a secret blend, High Gloss is extremely hard wearing, fingerprint resistant and incredibly long lasting. Supplied in a 130g level lid tin. Use sparingly! Related links to "high gloss wax"
Customer evaluation for "high gloss wax"